Update 13/09/2018: The MP Professional Examination Board (MPPEB) has started the Online Application Process for the High School Teacher (उच्च माध्यमिक शिक्षक) 17000 posts vacancies 2018. Interested candidates can check all details here. The Madhya Pradesh Professional Examination Board (MPPEB) has invited online applications for the 17000 posts of High School Teacher (उच्च माध्यमिक शिक्षक) 2018. Interested candidates can fill the MP Teacher 2018 Application form from 11/09/2018 to 25/09/2018. For detailed information about pay and allowances, eligibility conditions, the procedure of filling the online application form, recruitment procedure and tests, the applicants are advised to go through the below articles carefully. The Candidate must have Graduate degree with B.Ed or equivalent degree from a recognized education board. 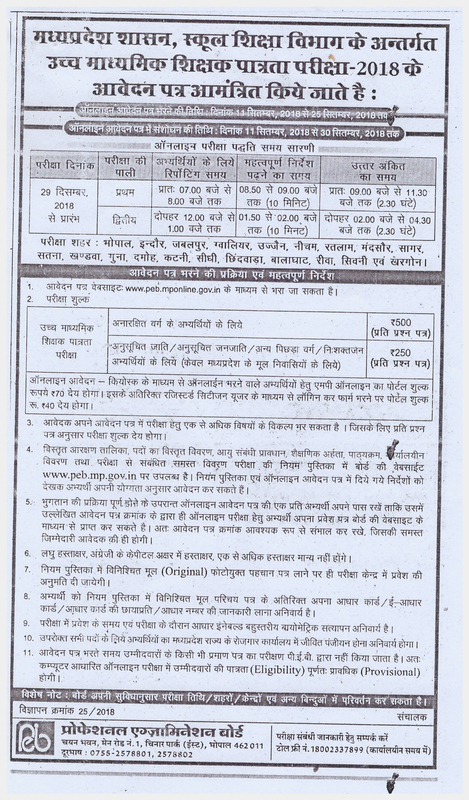 Interested and eligible candidates can apply through the official website of MP PEB Professional Examination Board at http://peb.mponline.gov.in. No other means of applications will be accepted. Candidates are advised to read all the instructions carefully before starts filling the application form. Application Fees: The application fees given following below can be pay by Online Mode. Along with that Rs. 70/- for Submitting Application form Through MP Online Kiosk and Rs. 40/- (With GST) for Submitting Application form Personally will be Charged for Portal from All Category Candidates. Selection Procedure: The Selection of Candidates on these High School Teacher Posts will be done on the basis of the Written Examination Marks Obtained by the candidates. Candidates can share their doubts or queries on the MP High School Teacher Recruitment 2018 through the comment form. Our team will clear your all the doubts.